The resort offers two different bedroom layouts for our Two Bedroom Suites. Choose from either one private bedroom and an open loft bedroom, or two private bedrooms. These suites can also have either one or two private bathrooms. All of them include a separate living room with a gas fireplace, a sleeper sofa, and a dining table and chairs. Your kitchen will have basic dinner, glass, and kitchen ware provided. Enjoy the outdoors on a private patio, balcony, or screened porch. 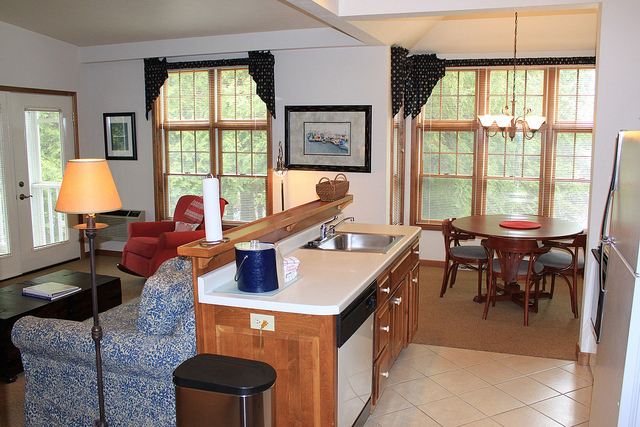 Choose between tranquil wooded views of Toft Point or incredible harbor views. These photographs represent just a few of our Lofted and Two Bedroom Suites. All of our units have unique decor, but conform to Baileys Harbor Yacht Club Resort’s highest standards.